Welcome Droid X owners to the mobile world of Adobe Flash on a smartphone - the world Steve Jobs doesn't want you to see. This week Motorola Droid X joins a small but growing club of devices running Android 2.2 (aka Froyo). The biggest improvement delivered by Android 2.2 is support for Adobe Flash Player 10.1 for smartphones. Before Android 2.2, surfing Flash-enhanced sites on a mobile phone was a limited experience only available to a couple of Nokia phones. But now, with Froyo running on around 30 percent of all Android phones, by Google's own estimates that is, we are just starting to get the taste of Flash on smartphones. For many the addition of Flash is a big deal, but the next question is what's there to do now? Sadly, because Flash for Android smartphones is so new there are few Flash sites optimised for the platform that take into considerations small screens and offer tools and diversions catering to mobile phone users. Here I've rounded up a list of 10 Flash enabled mobile sites that range from games, animation, to entertainment destinations tailored to smartphones. I've also included a longer list of 30 sites Adobe says were optimized for Flash mobile, but are not designed for the small screens. Eat your heart out Steve Jobs. Tip: Come back on this page from your mobile phone and click straight on the site's name to take you to the mobile version. Also, if you are on a non-mobile optimized site with Flash, just double-tap on the Flash content to see it in full screen. Check out dozens of free Flash games optimized for your Android 2.2 phone. Hundreds of simple yet fun games, designed to work with touch-based displays on mobile phones. 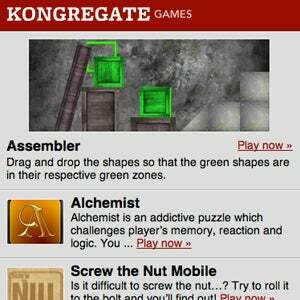 Kongregate has a huge selection for you to choose from, and there's a new interesting game featured every week at the top of the site. 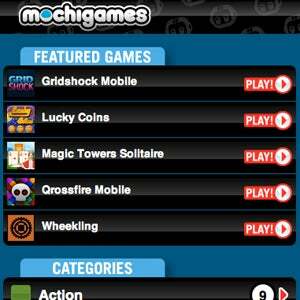 The mobile site Mochigames doesn't have as many games as Kongregate but has a sleeker interface and lets you select your games by category (action, puzzle, strategy), alongside a selection of five featured games. Note that you will have to watch a short ad before you start playing some games.